On recent evenings I have delighted to the trills of some nearby, well-hidden screech owl. Listening to its sweet sounds, I wondered where the name ‘screech’ came from. The next day, in an attempt to better acquaint myself with our unseen neighbor, I sat outside on the deck with my laptop and listened to some screech owl calls online. Imagine my surprise when, after the screech owl recording finished, I heard an answering call from somewhere in the trees nearby! Again I played the Internet screech owl’s call, and again came a reply from the trees! The call and response–or antiphonal–singing is what screech owls do, I’ve learned. Mated pairs and families keep in touch, day and night, by singing to each other, back and forth. This ‘song,’ which I have been hearing in the evenings is a rapid, single note ‘who-who-who-who.’ When a screech owl is defending its territory, it makes a series of descending ‘whos.’ And screech owls actually do screech, apparently, when they are defending their nest or a fledgling. Although I’ve read that screech owls are strictly nocturnal, it seems they have a daytime life as well, as evidenced by the mid-day response to my computer-generated owl sounds. And I’ve read that, by day, screech owls perch in the cavities of trees, or roost on a tree branch near the trunk. The best chance to spot a screech owl, I’ve read, is on a cold, sunny day, when an owl might be warming itself at the edge of a woodpecker hole or some other tree cavity. But owls can be hard to spot; their grayish or brownish mottled coloring is perfect camouflage against surrounding trees. And besides, these birds are very good at remaining motionless, especially when they fear they have been spotted. 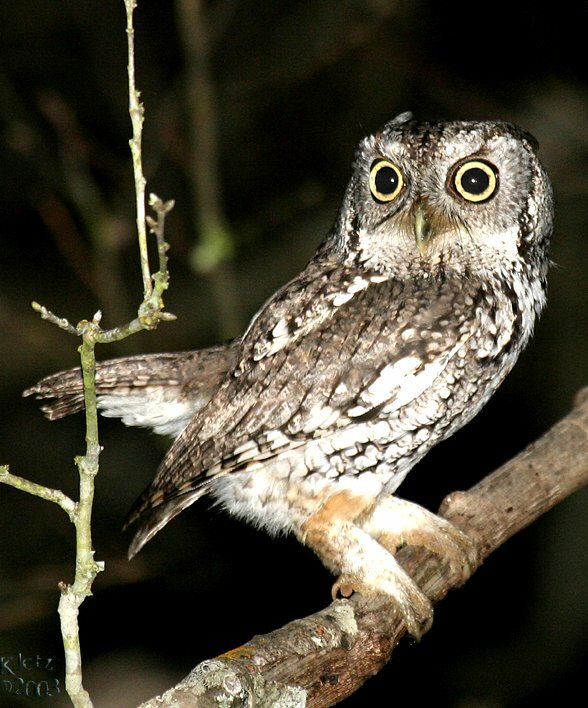 Apparently, the owls I’ve heard–and seen only once–around here are Eastern Screech Owls. Their range extends all the way from Canada to Mexico, from the east coast to the Rockies. And I’ve found out a couple of things about them that make me happy. One is that they don’t migrate. I like thinking they are nearby in the forest all the time, that any day I might hear or see one! I am also happy to learn that the Eastern Screech Owl is far more common than I’d thought. I regard it as good news that these birds thrive wherever there are trees, from deep in the forest to suburban neighborhoods and parks. Eastern Screech Owls may be common, but they have always seemed other-worldly to me. Their nocturnal nature and eerie calls, along with their elusiveness, combine to give them an air of mystery. Even so, a lot is known about the Eastern Screech Owl. Although smaller than most owl species, the Eastern Screech Owl has the typical owl’s round head, flat face, and piercing yellow eyes. Thought to mate for life, these owls do not build nests. Instead, they make use of an existing tree cavity. And instead of adding nesting material to the cavity, the female will likely lay her eggs directly on bits of fur and bone left at the bottom of the hole from previous meals. Mated pairs may return to the same nest year after year. A pair of screech owls typically produce one brood per year. The male feeds the female while she nests, and both parents feed the babies. This entry was posted on Saturday, September 14th, 2013 at 2:58 pm	and is filed under Insights and Visions on the State of the Earth. You can follow any responses to this entry through the RSS 2.0 feed. You can leave a response, or trackback from your own site.